SAINT AUGUSTINE – The Jacksonville University Orchestra, numbering over 60 musicians, will close out the 2017-18 concert series at St. Anastasia Catholic Church on Sunday, April 22. The concert, which begins at 6 p.m., will feature two student winners of the 2018 Concerto Competition, Walter Herrera and Bryce Rothermel. Herrera, a sophomore from San Pedro Sula, Honduras, is a cello performance major. Rothermel is a sophomore from Orange Park, Florida and is a trombone performance major. Other concert highlights will include the orchestra performing Beethoven’s Coriolan Overture and Tchaikovsky’s monumental Symphony No. 4 in F minor. 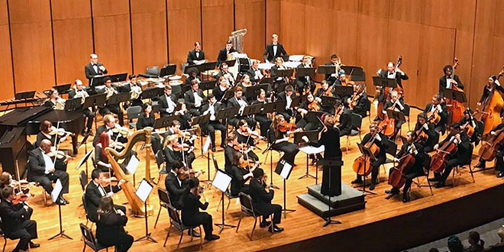 The Jacksonville University Orchestra is comprised of JU students, faculty and community members, and is conducted by Director of Orchestral Activities, Dr. Marguerite Richardson. Since coming to JU in 2007, Dr. Richardson, a violinist who also plays in the Jacksonville Symphony, has expanded the ensemble’s size and repertoire, including both classical and “pops” programming, radio play productions, musicals and operas, and movie sound track recordings. The free concert series, now in its 8th season, is arranged by Peter Morin, music director at St. Anastasia Catholic Church. A free-will collection will be taken at the concert for those who wish to contribute to the event expenses. Free parking is provided at the church which is located at 5202 A1A South on Anastasia Island. For information call 471-5364.